Have you ever looked at something, say a building, from several different angles and learned to appreciate its complexity the more viewpoints you had of it? In our gospel reading this morning we have several parables about the Kingdom of God, with each one offering a slightly different perspective on it. The Kingdom of God is not an easy concept to understand, so we may consider ourselves fortunate that when it comes to understanding the Kingdom of God we are given numerous parables in order to help us grasp it. In fact, there are more parables about the Kingdom of God than almost any other single topic in the gospels. I think this suggests that the Kingdom of God was a very important topic for Jesus – perhaps the most important topic. And given that he addressed these parables to the crowds, he must have thought it was an important message for them too. It is worth remembering that the crowd he was addressing was a largely Jewish audience in Roman occupied Palestine. Let’s begin with a look at the parable of the mustard seed. It is important to remember that Jesus says two different things about mustard seeds – and it’s important we don’t get them confused. In today’s reading, the tiny mustard seed grows into a large tree. Later in Matthew (17:20), Jesus says that if we have faith as large as the tiny mustard seed then we can move mountains. In this second passage, Jesus seems to be saying that if you have even a small amount of faith you can achieve a lot. This was not so much a parable as a simile, being a direct comparison between the apostles’ tiny faith and the small mustard seed which was even bigger. In our current parable, Jesus is making more a point about the process of the mustard seed growing into a large tree. There is dynamism to the parables of the Kingdom, there is action, and growth, and change. In trying to understand what Jesus was getting at, it can be useful to attend to common knowledge about mustard seeds that would have been known to Jesus’s own audience. We know that mustard seeds are small, but what is the purpose of the mustard seed? To someone like Richard Dawkins, the evolutionary biologist, the sole purpose of the seed would be to make more seeds, thereby perpetuating its genes. This is right on one level – the seed makes a tree, and the tree makes more seeds and in this way the seed perpetuates its genetic code. But one does need to be an evolutionary biologist to know this – farmers regularly save seed from their crops to use for the next season’s crop. The seed not only grows into the bush or tree – it makes more seeds and they make more seeds, there is no static mustard seed or tree, what we have here is a dynamic system of growth and renewal. Is then the Kingdom like this? Small seeds which make more seeds and in doing so pass on the code of the Kingdom. As Christians we know that we only know about Jesus because other Christians taught us the faith, invited us to church, gave us Bibles, and supported us when we had almost lost faith in God. And we have also passed on what we know of the faith in our small and large ways, by word and in deed. And as we know, one may sow the seed, and another may reap. But all this could have been said about almost any tree or bush. Along with the many interpretations of this parable there is a common interpretation of growth through the power of God. This true, but here I want to examine the mustard seed in particular, assuming that Jesus choose to talk about the mustard seed deliberately and did not choose this example at random. Some scholars have suggested that the mustard plant that was known to Jesus’s hearers would have been the Brassica nigra or black mustard. Knowing a little more about his plant suggests some interesting interpretations of this short parable. This plant, from which we get the condiment mustard today, is probably native to the Middle East. And like Christianity, which also started there, it has spread all over the world. It has been cultivated as suggested in the parable, but it also spreads itself by producing a lot of seeds which can survive for 50 years underground before coming to life. Black mustard can also have an ‘allelopathic’ effect on other plants, inhibiting their growth. This might sound unfriendly, until you realize that perhaps you don’t want other plants coming into your native territory. It is worth remembering that Jesus’s land was occupied by Romans who most likely brought plants from Rome to Palestine to cultivate for food. Maybe sowing mustard, as mentioned in the parable, was a way to undermine the crops imported by the occupying Roman army. For these reasons, the mustard plant has been considered a weed, and even in Jesus’s time it was not grown in the gardens of Jews. If it was deliberately cultivated at all, it was planted out in the fields. Even though we enjoy mustard with our hot dogs and steak, it remains a weed today – and an aggressive one. 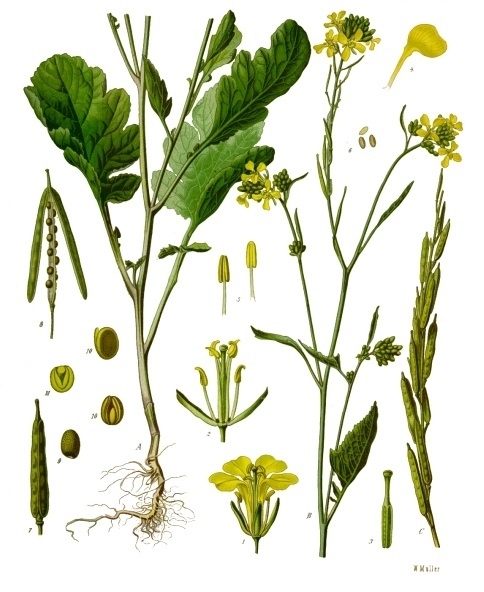 In New Zealand black mustard is considered an invasive species. It is humble plant, but an aggressive and subversive one, one that adds spice to life and a threat to settled ways of life. If Jesus deliberately choose the mustard plant for his parable its very nature suggests some interesting interpretations. But some questions remain unanswered. Are we the sower of the seed, or the seed, or the final tree, or even the birds resting in its branches? Before attending to that question, let’s look at yeast. The parable of the mustard seed is paired with the parable of the yeast and there is good reason to believe that these two parables are two versions of the same basic idea about the Kingdom. Yeast granules are also very small – smaller than mustard seeds. One of the things that yeast and seeds have in common is that they give of themselves in order to become something else. They are not only transformative, they are transformed. You will not find yeast in a loaf of bread, but you know it went into the dough. In just the same way as the seed disappears into the ground in order for there to be a mustard plant, the yeast disappears into the loaf. We know, like Jesus did, that to make bread rise you need yeast or leaven. Older translations often use the word ‘leaven’ instead of ‘yeast’. ‘Leaven’ is probably preferable as it was not until 1859 that Louis Pasteur first discovered how yeast works. He found that yeast feeds on the starches in flour, producing carbon dioxide which then expands the gluten proteins in the flour causing the dough to expand and rise. Leaven was a piece of dough with yeast in it, saved over for the next batch. In this case, a small amount of leaven is hidden into 3 measures of flour, which would produce enough bread for 100 people. But, you may be thinking, the Jews ate unleavened bread. For the Israelites leaven was a corrupting influence. Later in Matthew (16:6) Jesus warns against the leaven of the Pharisees and Sadducees, using this as a metaphor for their false teaching. This metaphor relies on the fact that yeast, even in baking, can be a nuisance. Bakers have long known the airborne yeasts can contaminate their dough. Yet fans of Belgian beer are thankful that Trappist monks use naturally airborne yeasts to good effect to ferment their world-beating beer. How surprising then, that in the parable we have a woman deliberately adding yeast to her dough. To the Israelites this would have been considered a crazy thing to do. For them leaven is a contaminant. Everywhere else in the Bible, in both Old and New Testaments, leaven is considered a negative influence. Again, we can ask: in this parable, are we the leaven, the baker, the flour, or the bread? It is not easy to say. What these two parables share is the action of someone deliberately sowing something seemingly unwanted into something, which then grows into something new. Jews would not have wanted mustard sown in their gardens, or yeast to enter their bread. And yet this was how Jesus explained the coming of the promised Kingdom. In these parables Jesus was confounding his audience’s expectations of what the Kingdom of God was. To understand their shocking power we need to understand what the Kingdom isn’t. We can be tempted to think that the Kingdom grows like a plant from small beginnings to be a huge church. This was a comforting thought at the height of Christendom. But Jesus’s parables do not contain any teaching of inevitable growth or progress. Our experience today is that the church in many places is shrinking – it is becoming small again. But smallness, as our parables teach, is no bad thing. Rather than focus on size, we can be attuned to the ways in which God can use the small but potent force contained within our lives and our churches in the subversive work of God’s Kingdom. Nor is the Kingdom of God politics as usual. It was not the kingdom or empire imposed by the Roman Empire. The Jews had no trouble understanding that. But the Jews expected some kind of political kingdom, like the restoration of the Davidic Kingdom which we read about in the Old Testament. The coming Messiah would, many of them hoped, usher in a new earthly kingdom. But the Kingdom of these parables is not political reawakening. It is humble and subversive and not of the order of this world. I want to suggest that in these parables we are the seeds and the leaven planted by God in the ground and in the flour to make new things for his glory. Sometimes considered by the world to be worthless or a blockage in the world – we Christians can can planted, like the individual mustard seed in the parable, by God to get in places where we can make a small but important difference. We confess that we are sinners, and may think we are not worthy to be a part of God’s Kingdom. Even s0 – God has a place for us in his Kingdom. Like leaven we can be placed into situations in order to corrupt the values of the world and let God’s bountiful Kingdom come forth. In this process of allowing ourselves to be used by God for the work of the Kingdom we can die to our old selves, like the seed or the yeast, and give our newly transformed lives for the expansion of the Kingdom and something greater than ourselves. Some Christians have done this in witness to Jesus’s message. Consider the subversive witness of someone like Dietrich Bonhoeffer, who resisted Hitler’s Nazi regime, training ministers underground in defiance of the law. His legacy lives on today. God can see the potential of our small lives and can plant us in situations where the Kingdom, through his power, can grow and flourish. The Kingdom is within us, like the tree is within the seed. We only need to allow God to plant us where we are needed. As far as reading is concerned, what undoubtedly influenced me most, during the critical months of inner wrestling, to conclude that I could not “bend” the Sermon on the Mount and the whole concept of the Cross and suffering love to accommodate participation in war, was the serious reading of the Christian mystics. ~ A. J. Muste, ‘Sketches for an Autobiography,’ in The Essays of A. J. Muste, N. Hentoff, ed., Bobbs-Merrill, Indianapolis, 1967, p. 47. Here Muste specifically mentions the work of Rufus M. Jones as being helpful. Many of his works are freely available on Archive.org.